A celebration of inclusion was held Saturday afternoon at Ethel Tucker Centennial Park in Okotoks during the first Pride event in the town’s history. 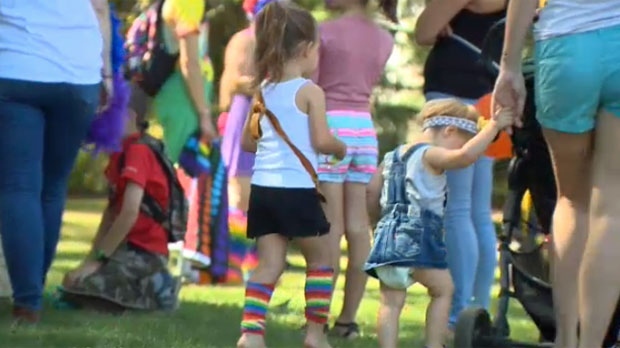 According to members of the Foothills Rainbow Connection, a grassroots initiative, the family-friendly Pride in the Park festival was open to everyone and served as a testament to noticeable change within the community. The event included the distribution of kindness rocks, brightly coloured rocks bearing positive messages, a kid zone, live music, glitter tattoos and a story time where drag queens read to the children. Dallas Mustard, a musician who took to the Pride in the Park stage, said the event was about “coming together for a common cause and just having a great time”. Dianne Lynch took in the festival alongside her husband and their two sons. The family sported shirts promoting love and acceptance. The festival was followed by an after-party at The Royal Duke Hotel.